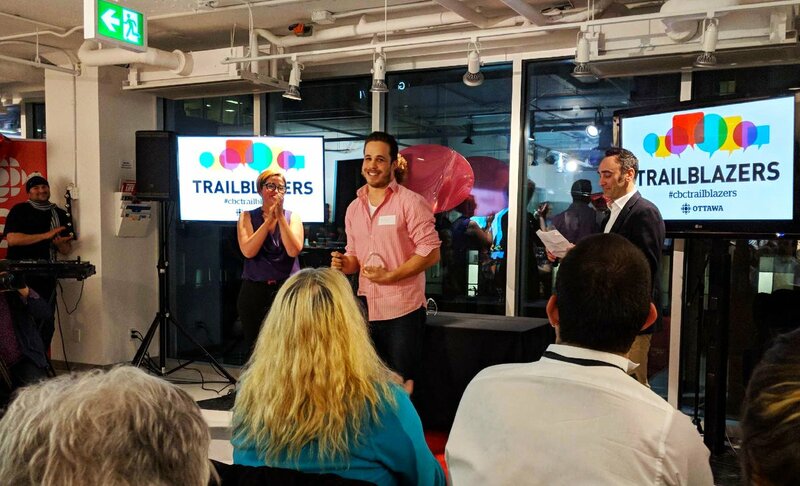 It's been an honour to have Rian Alston recognized for his work at theSpace as our Creative Director along with many other amazing individuals from around Ottawa. It's been a joy discovering and celebrating all the great work being done in our community. His hard work and dedication at theSpace has insured that dozens of our adult members can laugh, learn and create in new ways each day. theSpace thrives by allowing individuals such as Rian to help our members break down barriers to learning and connecting by following a dynamic and relational approach that values experience and the understanding that everyone learns differently and their passion is key to sparking a life-long desire to learn and create. The mentoring and facilitating role Rian has assumed over the past year has been vital to our team and personifies what makes theSpace unique and successful. Thanks to Carleton University School of Journalism and Communication for allowing several of your wonderful and passionate students visit theSpace back in February and film a snapshot of what goes on day-to-day while also highlighting some of our amazing members. Check it out at The 25th Hour's website. It was a pleasure to sit down over lunch and speak with attorney general Yasir Naqvi. We were able to discuss our unique model here in Vanier along with other topics such as the future of sustainable and inclusive community. It was a great opportunity to go discuss not-for-profits, resources and highlight our next steps. 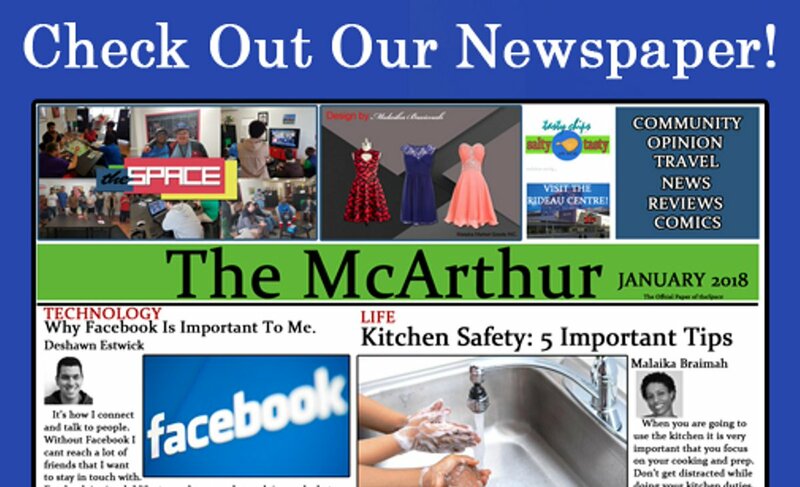 We are proud to publish our very first edition of the McArthur! It has been a month long project created by our regular members who together, shared their passion, interest and talents. We plan to continue to write, edit and publish our newspaper each month as we expand or coverage and expertise. It's been a lot of fun seeing everyone research and combine their knowledge of writing with computer and various writing software. The articles, ads, opinions and travel blogs reflect the diverse range of skills and hard work each person has contributed. Thanks for reading and remember to share! Our team has been thrilled to begin sharing more details about theSpace after our massively successful Kickstarter funding campaign. Thanks so much RogersTv as well as everyone who has hosted us over the past several months. We are so excited to let Ottawa and everyone in our community know about our new creative studio. Already new members are joining our workshops and we are consulting with a wide range of community supports to find the right facilitators to help members to connect and create. Top 10 finalists for the TVO 2018 Short Doc Contest! theSpace is thrilled to be included in this years TVO documentary contest. The film was created by a small group of Carleton Students. Please check out the amazing films that highlight some very important issues. Don't forget to vote! The first Winter Exhibit hosted by theSpace on Friday, November 17th was a great success! People of all age groups attended and all of them were genuinely impressed by the quality of the work---in fact about three-quarters of the work on display was sold. 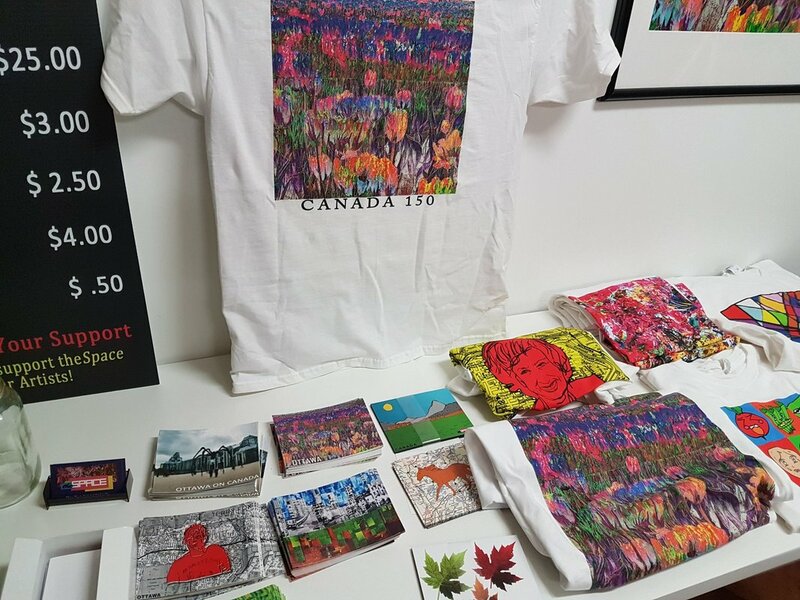 Equally important, however, was the chance for people to see theSpace and begin to understand just how innovative it is as a social enterprise. In only eight months, theSpace has moved from an idea to a reality. However, it is the play between idea and reality which continues to provide valuable lessons on how to evolve our core concept. What we’ve really come to realize, is that theSpace offers the means for our members to engage in an apprenticeship for creative self-employment. What is profoundly important is that by awakening and nurturing the unique creative curiosity and interest of each member--we are simultaneously helping them to foster an intrinsic motivation for lifelong learning, and self-development. When we find our creative potential--this is a form of finding our voice. When we find ways to have our voice valued, we model a basic form of self-advocacy. What we have come to see, ultimately, is that the myth of the isolated creator, working alone, is just that. For all creators depend on a creative commons - that educates their imagination--the sense of what’s possible. Also, all creators depend on a community of other creators - for inspiration, for feedback, for learning, for challenge. Think of the Group of Seven, or writer’s workshops or all the coffee houses and other social place where creatives have always met for conversation and interaction--these social spaces have always been vital elements for any creator or creative process. And so we have come to realize that all creators need some form of generative community; which theSpace also nurtures, through it’s platform of group collaboration---while working on individual pieces---as well as by blending social opportunities such as games night, birthday parties, seasonal celebrations and other forms of ‘hanging out’. Our most recent insight is that the emphasis on helping our members to find their ‘creative voice’, also models the process of developing their voice for self-advocacy---while preparing them for greater autonomy through trusted interdependence. Having a supportive community is essential for building confidence and trust! For most of our members, the emphasis, throughout their schooling, has been on developing basic skills and attitude suitable to finding some form of generally basic employment. While this has been widely assumed to be the best path to becoming a contributing member of society---the consequence for many people with disabilities is often an emphasis on learning to comply with ‘the rules’, and not making waves. This can have an unintended effect of undermining or challenging the development of a confident voice for one’s own ‘self-advocacy’. 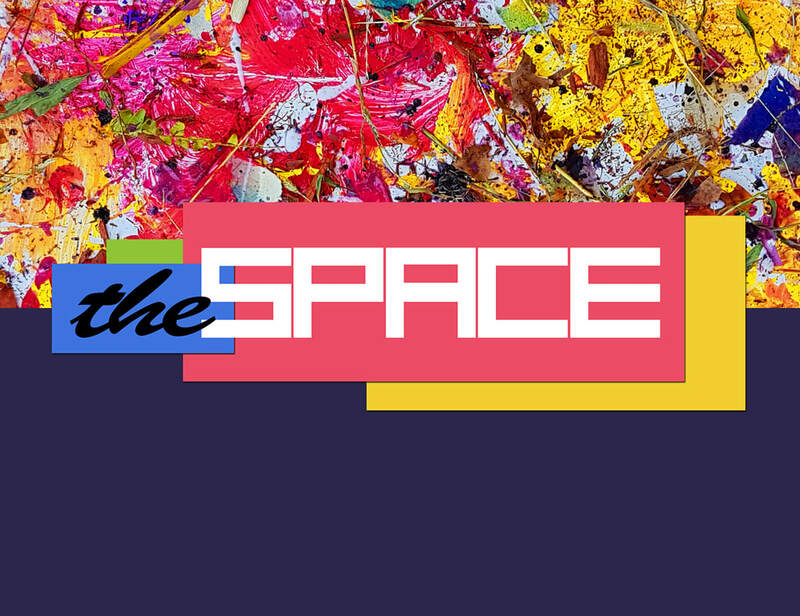 In this way, theSpace offers a welcoming third space, (outside of work or home), where members can feel a sense of belonging and membership, as well as an unscripted and sophisticated experience of peer mentorship, friendship and to express genuine and sustainable personal agency as an independent from but complementary to work and home in building a confident voice of self-advocacy. To summarize our insights to date - theSpace offers members an opportunity for apprenticeship for creative self-employment, as well as building a generative community which supports more effective autonomy and self-advocacy. This is what all of you have done---helping to making theSpace a reality---by helping us to reach our goal, and by spreading the word! Thank you! The feeling of success is really quite wonderful! And…by successfully topping this goal, you have ensured that we can now begin next steps. These include finding our location, writing up our projects and activities and connecting with all of those community groups and organizations who have reached out to ask about joining us on this extremely significant journey. A very busy time ahead, but very exciting! At the same time---we're not done yet---and still have only a few short days left. We want to continue to make this project the very best it can be…so please do continue to pass along our links, and we will do the same! And...stay tuned! !